The ABC is essentially a taxpayer funded advertising machine for the renewables industry. On a national basis, household bills are set to fall by 2.1 per cent — but price falls in the eastern states and South Australia are offset by increases in Western Australia, the Northern Territory and the ACT. We pay the ABC three million dollars a day so they can parrot press releases. Unpaid bloggers only had to read to paragraph 24 to find the report says that the renewable subsidy may lead to higher wholesale prices (page V, summary, para 24). The qualification “may” applies to the renewable schemes that don’t “incentivize investment in firming technology”. In other words the “may” might as well be a “must” in Australia. There are no cheap options for “firming technology” that the RET is not actively forcing out of the market. The price reductions will go some way to reversing big power bill hikes driven by increased cost and market volatility driven by the retirement of two brown coal power stations — Northern at Port Augusta in SA, and Hazelwood in Victoria’s Latrobe Valley. The big picture is all a bit complicated for big-welfare-journalists. See the graph above. The carbon tax increased the price. The closure of coal plants increased the price. Renewables have increased through the whole duration of this graph and so has the price. What will make electricity cheaper … ABC says “renewables”. Sure. Firstly the subsidy itself costs money, secondly it indirectly it drives out reliable, cheap supply, then thirdly, it adds an unreliable supply that makes the other generators on the grid less efficient and higher in cost too. The direct costs of the large-scale renewable energy target (LRET) are included in the environmental component of the cost stack. However it is important to also recognise the indirect impact of this policy. The LRET provides incentives for increased quantities of renewable generation to enter the market, even when demand is flat or falling. This is because the revenue that these intermittent generators receive from the scheme is additional to that available. Over time, to the extent to which the LRET contributes to the exit of thermal generation but does not incentivise investment in firming technologies, it may result in a tighter supply-demand balance and lead to higher wholesale prices. from the wholesale market and the LGC penalty price is higher than the expected long-run cost of investing in new intermittent generation. While the ABC tells Australians that renewables make electricity cheaper, the AMEC report makes it clear that more rooftop panels make electricity generation more expensive for the reliable generators on the grid. In the WEM, wholesale costs were estimated based on a Long Run Marginal Costs (LRMC) approach for the electricity system. a slight increase in peak demand and a change in residential demand shape related to the increased penetration of rooftop PV systems. This reduces the energy demand met per fixed capital cost of generation, such that the long-run marginal costs of generation increase. increasing gas and coal prices. The direct costs of the Renewable Energy Target are between $50 – $250 a year and rising. But the real costs are the indirect costs. The price of wholesale electricity has tripled in the last three years. Bear in mind, these are averaged costs. Those with solar panels have much smaller electricity bills and therefore pay a lot less RET. But AMEC gets too clever in graphing the effect of renewables. Here they do a graphic that makes it appear the upside and downside of renewables is kind of similar, when we know, and from all around the world that nations with more renewables have a lot more expensive electricity. Wholesale market costs account for 33 to 57 per cent of a consumer’s annual bill in 2017-18, depending on the jurisdiction. Decreasing wholesale costs are the primary driver of retail prices and bills in most jurisdictions over the reporting period. The exceptions are Western Australia and the Northern Territory. On a national basis, residential electricity prices and bills are expected to decrease in the period from 2017-18 to 2020-21. This trend is primarily driven by wholesale costs reducing in South East Queensland, Victoria, South Australia and Tasmania. The reduction is driven by the estimated entry of 9,732 MW of accredited, committed or expected new generation and battery storage. 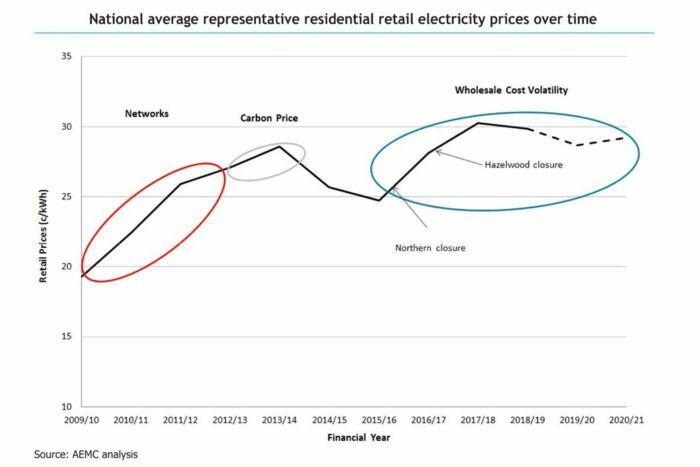 … The wholesale cost reductions are larger than the expected slight increase in network costs and higher environmental costs that are driven by increasing costs associated with the Small-scale Renewable Energy Scheme (SRES). • 8,961 MW of new large-scale intermittent generation. • 205 MW of battery storage, supported by jurisdictional programs. What about the new solar PV? That’s not counted in the 9GW? How about a 350% increase in the growth of renewables in just one year: We added 1,042 MW of renewable generation in 2018 but will put in an amazing 3,663 MW in the 2019 financial year. We added 30 MW of battery storage in the last year then 75MW is coming this financial year. (see 2.2 p8) This reduced the cost of wholesale electricity from bleeding point to “slightly less”. It’s a temporary blip down from a volatile spike. But the long term trend is up, up, up. Of all the renewables going onto the grid, the cost burden that is rising the fastest is rooftop solar, not wind or solar thermal even though they are being added at record levels. In Queensland, not only is half the cost of the panel paid through the SRES scheme (which means it comes from other consumers) but the other half of the cost is paid as a no-interest loan from the Queensland government. (Section B4, p68). This plan which will make electricity more expensive is called the Queensland Affordable Energy Plan. Naturally. The aim of the program is to have 1 million rooftops or 3,000 megawatts of solar PV in Queensland by 2020. The program’s initiatives include reforming feed-in tariffs, statutory voltage limits and Solar 150 (large-scale solar investment). Subsidies pile on subsidies. How many ways can the government help the ailing, uncompetitive, pointless renewables industry? • Wholesale costs, wholesale price volatility and the wholesale contract market continue to be affected by environmental policy, with increased levels of intermittent generation, incentivised by the large-scale renewable energy target (LRET). As the LRET target for 2020 is expected to be met through the large volume of new renewable investments in the coming years, and the price of large-scale generation certificates (LGC) is expected to fall significantly as a result, the LRET is not expected to drive additional investment in new renewable projects after 2020. Price Trends 2018 Report, Australian Energy Market Commission (AEMC).